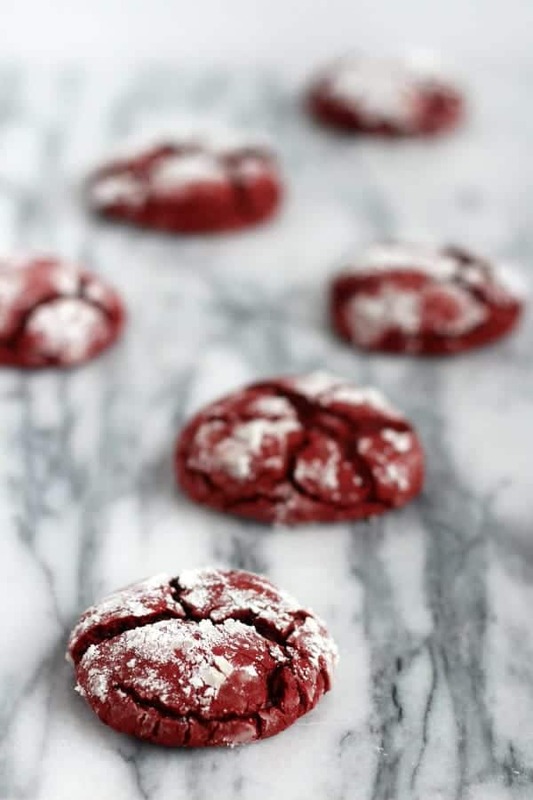 These red velvet cookies couldn’t be simpler to make. Great for a last-minute Valentine’s Day treat! These days — you see “red velvet” everything. I featured a few of those gems yesterday in my round-up of decadent chocolate Valentine’s Day desserts. Red Velvet pancakes, red velvet dip, red velvet bars, cheesecake, cookies and more. Some are labor intensive, some easy, but all have the chocolate taste you love and that unmistakable red hue. Red velvet is perfect for the upcoming love bird holiday (great for Christmas too!) but I say it’s great any time of the year. 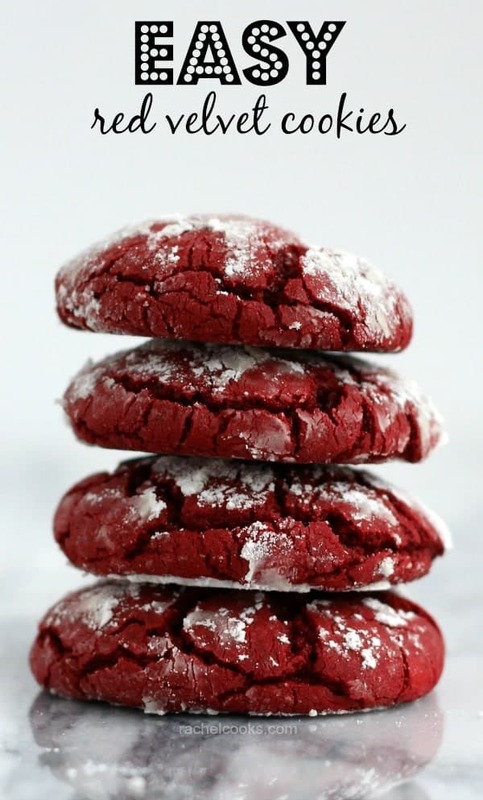 These red velvet cookies are unbelievably easy to make. Next time you’re at the grocery store, pick up a box of red velvet cake mix (any brand!). That’s where the fun begins here. To that, you add some melted butter, a couple of eggs and stir stir stir! Then you roll the batter into balls, coat in some powdered sugar and cornstarch and bake. You’re left with thick, chewy cookies full of the red velvet flavor you love. These would be perfect to send off to school with your kids. Or for a Valentine’s bake sale. Or to mail to a friend who might need a little surprise come Valentine’s Day. Or you could just eat them yourself. That would be a good idea too. A very good idea. If you’re still looking for some fun cookie recipes, make sure to check out these dark chocolate and pecan cookies, whole wheat chocolate chip cookies, or these last-minute Valentine’s Day cookies. I’m also loving these easy three ingredient peanut butter cookies from Barefeet in the Kitchen! These are delish! 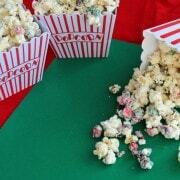 My only comment is that you definitely don’t need 1 cup ofowdered sugar to roll these in. I had so much left over that went to waste because it had cornstarch in it and I didn’t know what to do with it. But again, they were yummy! So easy! Panera had a red velvet cookie they discontinued and they are similar! This will definitely be a repeat treat! Pingback: Baking Whilst in Recovery. i love red velvet. the cookies look great! Love red velvet! Definitely a Valentine’s Day dessert! I hate to sound like everyone else but these are pretty photos. What is it about red velvet anything that we are so drawn too? 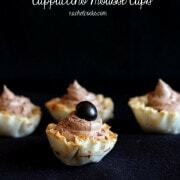 These look super simple to make and perfect for Valentine’s. I’ve made red velvet cake before but never cookies! Not big fan of red Velvet cookies.. but looks so good.. maybe if we sandwich them with a little Cheese cream Frosting… What do you think? Whoa. These ARE easy! And so pretty too. They look great! What a great, fun Valentine’s Day idea. 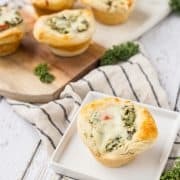 The kids will love making these!